Students take stairs, receive a treat | Grand Central Magazine | Your Campus. Your Story. As students walked up the stairs in Moore Hall, they received a special treat. Senior Becky Burtka was handing out free LUNA Protein bars to the students who decided to take the stairs over the elevator as part of a promotion for good heart health. Burtka will be continuing this experiment throughout the semester for her honors capstone project. This is part of the, “Take the Stairs” Campaign. 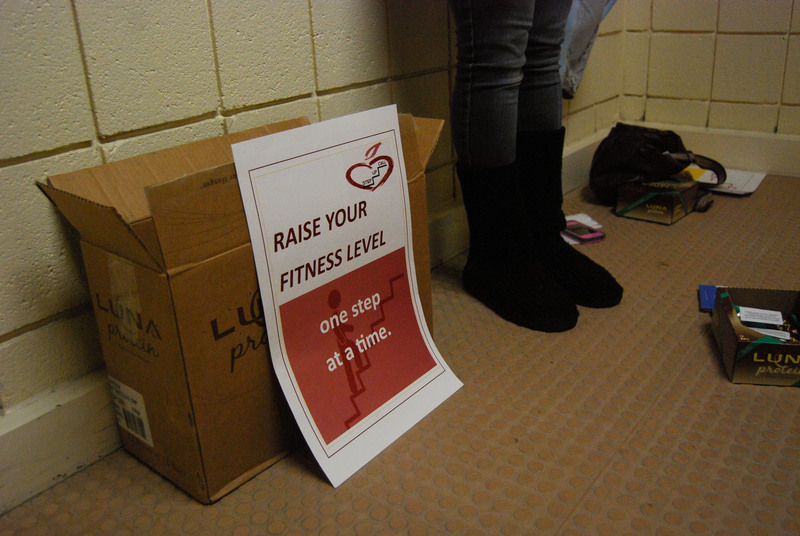 With LUNA bars and other snacks being passed out from the “mystery stepper” around campus, Burtka hopes it will help raise awareness to Central Michigan University’s faculty and students about heart health awareness. Burtka received a $50 donation from the school and 12 cases of LUNA Protein bars from University Recreation. Seventy-nine bars from her stash of 150 were handed out in her first week. Becky Burtka passes out Luna Bars and other healthy foods to people who take the stairs instead of the elevator in Dow Science Complex on Friday, Nov. 8, 2013. The Luna Bars were donated by University Recreation after becoming interested in Burtka’s senior project. Each LUNA Protein bar has a total of 190 calories. A calorie is defined as the energy required to raise one gram of water by one degree Celsius, according to Medical News Today. Burtka said walking up the stairs burns almost five times more calories than riding the elevator. Also, walking up the stairs for two minutes a day can prevent weight gain, according to nyc.gov. Burtka said although the LUNA bars provide many more calories than taking the stairs burns, the bars have other health benefits. “I originally planned to hand out apples and bananas, so we didn’t choose the LUNA bars, they were just a bonus,” Burtka said. She said she will still hand out fruit on different days. There were 4,450 elevator trips upward taken during the duration of 10 days in Moore Hall. The number of trips down were not available, according to a Central Michigan representative. The Park Library has a similar number of elevator rides up with 5,185 trips in 10 days. Wheeler Hall had record trips with a total of 18,946 trips in 10 days. “The more the word gets out, hopefully the more we will be able to change behavior,” said Tammy Griffin, manager of health and wellness, as she helped Burtka hand out snacks. According to the Center for Disease Control and Prevention, heart disease is the leading cause of death for men and women each year resulting in 600,000 deaths in the United States, which is one in every four deaths. Also, every year about 715,000 Americans suffer from a heart attack. Burtka said she is trying to promote heart healthy habits and help make physical activity a part of everyone’s daily routine. “I figured people would take the stairs more if they were rewarded,” Burtka said. Several students who took the stairs were excited, positive and interested in learning why they were receiving a treat. Some students said they would try to use the stairs more often, Burtka said. Faculty and staff members are constantly faced with the decision every day whether to take the stairs to their office or not. “I do take the stairs, up and down, multiple times a day, it’s healthier and I’m able to take the stairs so I do that,” said Michelle Carson, secretary of the Broadcasting and Cinematic Arts office. Other faculty would rather take the elevator. Ronald Marmarelli, a journalism professor, said he prefers the elevator because it is easier on his knees. Not only is the faculty faced with the stairs daily, but 19,634 students are as well. “I use the elevator to go up but I take the stairs to go down,” said sophomore Arielle Hines. However, other students such as junior Aubrey Petty doesn’t feel the need to use the elevator. “I feel like it’s a waste of time to take the elevator when it’s only a few flights up the stairs to class and it’s also healthier,” Petty said. Becky Burtka passes out Luna Bars and other healthy foods to students who take the stairs instead of the elevator in Dow Science Complex on the campus of Central Michigan University on Friday, Nov. 8, 2013. On some days, Burtka passes out more than 150 Luna Bars to students in the stair cases. Separator image Posted in College Life, Community, Lifestyle, Students, Students and tagged with Alyssa Hearin, Campus Life, health, LUNA, Protein Bar, Stairs.